What’s your appetite for disruption? You may have found the right disruptive talent to develop game-changing business ideas, but if you don’t provide them with the right opportunity then your investment in these people may be wasted and their ideas may never be realised. So in thinking through how you might provide the right environment for disruptive talent to act you need to consider two perspectives: what degree of protection and support are you willing to give the disruptive talent and what degree of protection are you willing to give the core business that most likely will be impacted by the disruption. Regarding protecting the talent, this relates to a well-catalogued history of disruptive ideas emerging within businesses that the core business then consciously or subconsciously kills off. For what is termed the “tyranny of the core” can often seek to preserve itself at the expense of any alternative future. Meanwhile, in protecting your core business, you need to be clear about the level of appetite for disruption that you want that could potentially negatively impact on your short-term profit. 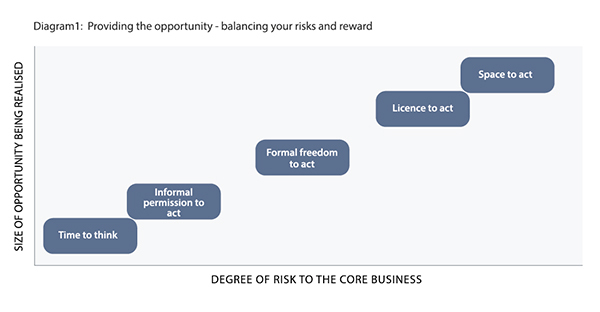 So how can a business get the balance right between allowing disruption to occur without a) lethally affecting the core business, and b) the core lethally affecting your new opportunities? How disruptive are you prepared people in your business to be? And what degree of freedom and protection are you willing to offer them? And in the public sector, Centro – (the public body responsible for delivery of public transport in the West Midlands), has brought together a group of young professionals to envisage a future whereby the people of the West Midlands are highly mobile, through a combination of embracing the possibilities of new technologies and pursuing more sustainable travel options. These ideas are then being fed into its formal management structure and processes. The firm’s leadership can also create the right environment in which individuals and teams are able to break some rules in order to create something new. This is established at a more informal level by the tacit behaviours of the leadership team in what they support, condone and resist. When Stanley Kalms was CEO of Dixons Stores Group, he would personally promote the idea that every Area Manager should have 10 mini-trials or experiments underway at any one time – to try new ideas out and to quickly pass on anything that worked. To make it harder for others in the organisation to challenge and prevent the disruptive ideas from succeeding, a company can establish ‘rules’ within its existing structure which define set resources (human and financial), along with goals, milestones and support within which disruptive projects can thrive. This is how one client is currently working, and has created a set of strategic initiatives, populated with identified disruptive talent, for creating new additional revenue streams that will cut across its existing set of businesses. Once a disruptive project gains some traction, the business may then ‘up a gear’ and switch from supporting these disruptive endeavours as projects within a governance framework, to creating a separate organisational entity, with its own resources and separate management processes, to allow it to grow into something more substantial – before possibly grafting it onto the existing business. For Vodafone to get its 3G business up and running, it needed to create a separate business, one junction down the M4 motorway away from its core 2G business in Newbury, in order to give it the freedom needed to create what was then a future digital world. All of the above can be seen as being more incremental in approach and giving disruption a marginally longer leash. Yet occasionally, the ideas coming forth may be seen as just too radical for the core business to risk. So a more radical approach is needed. One such way is when a company creates an internal market of resources and ideas, within which people are given the freedom to form, develop, grow, merge, reduce and kill off ideas. Then there are other times when a company realises that inventing everything by themself is no longer an option, as it can be too slow and costly, and limits your access to the required technologies and talent. In this case, those making decisions on funding options can opt to create an entity outside the formal organisational boundaries. This is where Venture Capital funding, or setting up Joint Ventures can be a suitable approach. Mundipharma International for example has a network of independent, privately owned associated companies and joint ventures with a presence in 23 European countries. And also note AstraZeneca’s reasons for moving its new global R&D centre and corporate headquarters to Cambridge, to be at the heart of what is seen as an ecosystem for life sciences, providing valuable collaboration opportunities. These examples can be seen as form of Open Innovation in which a business harnesses external ideas and contributions internally and also leverages internal capacities externally by making them available to external parties. 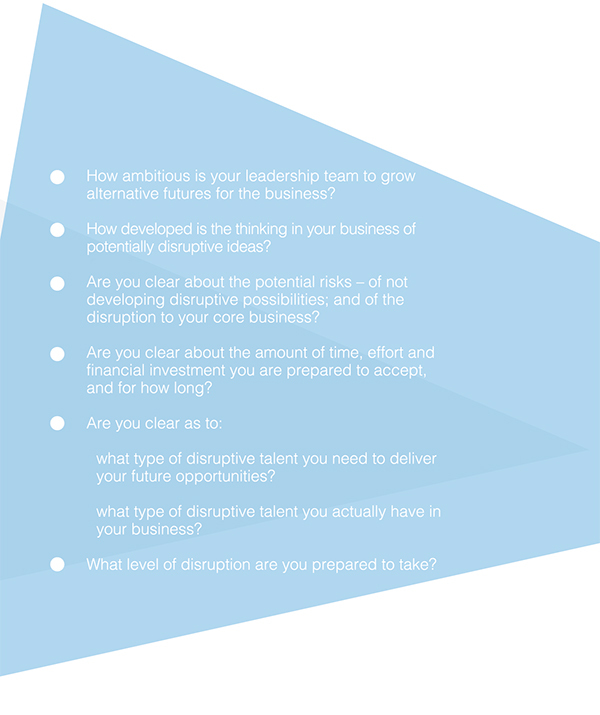 These five different approaches provide varying degrees of opportunity in which disruptive talent can flourish. Choosing the right model for your organisation is a reflection of your leadership’s appetite for disruption and their assessment of how much disruption the business can cope with at any particular time. How ambitious is your leadership team to grow alternative futures for the business? By investing in disruptive talent, you are in effect trading off existing actual profit for future potential profit, and betting on how best to give disruption the opportunity to succeed. So to ensure you make the right call, we can work with you to think through these questions, in order to ensure you have identified the right talent for the job, established the right boundaries around which your disruptive talent can develop business opportunities, and that you are comfortable with your company’s organisational resilience to sustain the disruption, and ultimately have a top team with the right level of ambition and imagination to provide the opportunity for disruptive talent to flourish.